Global Network | Cashew Co., LTD.
Business contact: 1 Songbai Road, Songgang, Baoan District, Shenzhen. Block L, 9th Floor, On Wah Industrial Building, 41-43 Au Pui Wan Street, Fo Tan, Shatin, Hong Kong. Denggaoshi Industrial Zone, Yamen Town, Xinhui District, Jiangmen City, Guangdong Province, China. V Brother Industry Co., Ltd.
Weilburger Coatings (India) PVT LTD. It is said that globalization in Japanese industries actually started in the mid 1980's. However, Cashew focused on the world much earlier, in the 1960's. 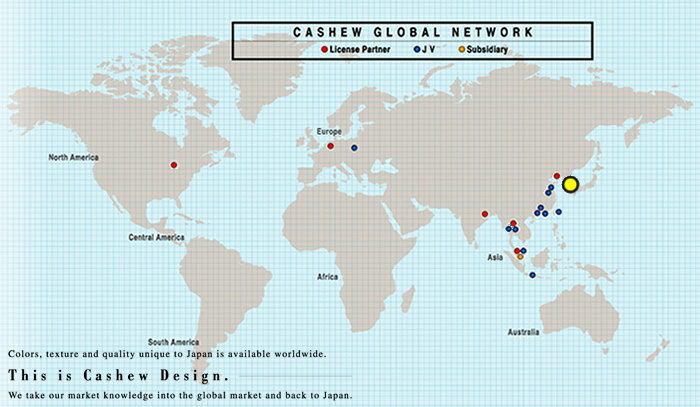 Today the name "Cashew" is rather better known in world industries. our supply chain which provides the same quality and service anywhere in the world.